An artist's impression of the Milky Way as seen from the outside. New research suggests that the Orion Spur, or Arm, is almost twice as long as scientists had previously thought. The sun's galactic neighborhood just became a bit more significant. New research reveals that the sun's branch of the Milky Way may be several times longer than previously measured, which would make it a significant contender in the structure of the galaxy. Spiral galaxies like the Milky Way contain several massive structures known as arms, which unwind from the galaxy's center. The sun's neighborhood is called the Orion Arm, though scientists often refer to it as the Local Arm. Despite its name, it is classified as a spur — a collection of dust and gas that lies between the more massive arms. According to Xu, characteristics of the Local Arm "are comparable to those of the Galaxy's major spiral arms such as Sagittarius and Perseus." "Determining the structure of the Milky Way has been a long-standing problem for astronomers because we are inside of it," Xu said. "While astronomers agree that our galaxy has a spiral structure, there are disagreements on how many arms it has and on their specific location." "All of the structures are projected on top of each other, and without accurate distances to these structures, it is impossible to infer the design," Reid told Space.com by email. "All they need is a source of energy — analogous to the battery in a laser pointer — and long path-lengths to amplify the emission," Reid said. "In star-forming regions, the more massive and very young stars provide the energy." Using the National Radio Astronomy Observatory's Very Long Baseline Array (VLBA), a suite of 10 telescopes operating in Socorro, New Mexico, the scientists identified and measured eight new masers in the Orion Arm, setting its new length at about 25,000 light-years long. (A light-year is the distance light travels in a year.) Although measurements of the arm vary, Xu’s team set the distance as being just over 16,000 light-years in 2013. "This characterization of the Local Arm will change the image of the Milky Way," Xu said. "The Milky Way, while probably a 'pretty galaxy,' has significant irregularities," Reid said. "Based on our observations, it is clear that there are four major spiral arms and some non-symmetric structures like the Local Arm." 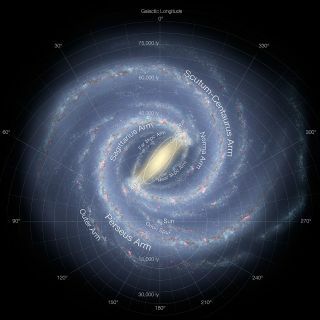 Further studies are needed to determine how irregular the Milky Way might be: "Without a complete map of the Milky Way, however, it is not clear how symmetric the four arms are," Reid said. "We need more observations, particularly from the Southern Hemisphere, so that we can map the entire Milky Way," Reid said.